A short update. I've been getting really nice results with this antenna. It does a great job on the LW and lower end of the MW band, where the sky loop is too short (even though it is 670 ft in perimeter). Also seems to do better on the higher end of HF, where the sky loop might be too many wavelengths long. I asked LZ1AQ, who made the amplifier I use and came up with this antenna design, if putting a second set of loops in parallel would provide any significant improvement. He estimated perhaps a 10% increase in signal, and no improvement in signal to noise ratio, and said it was not worth doing. Sounds good to me! Nice looking loop there Chris!. Can you rotate it remotely? Yes I can, although I have no feedback as to the orientation, I can just rotate it CW and CCW. And hope I remember how far I have done so in each direction, so I don't wrap coax around the mast. The antenna itself reminds me of a fractal. Springtime antenna projects continue... 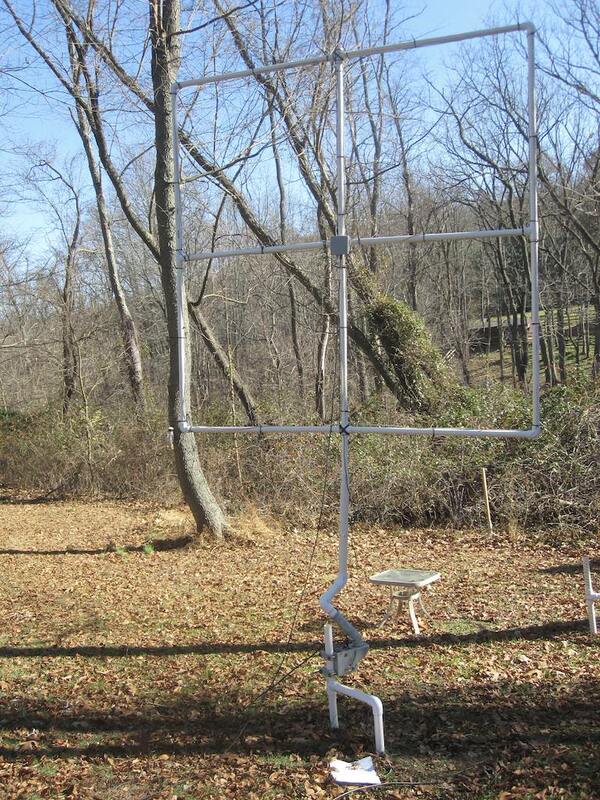 I elevated the crossed parallel loop antenna. There's a lawn chair in the picture for scale. 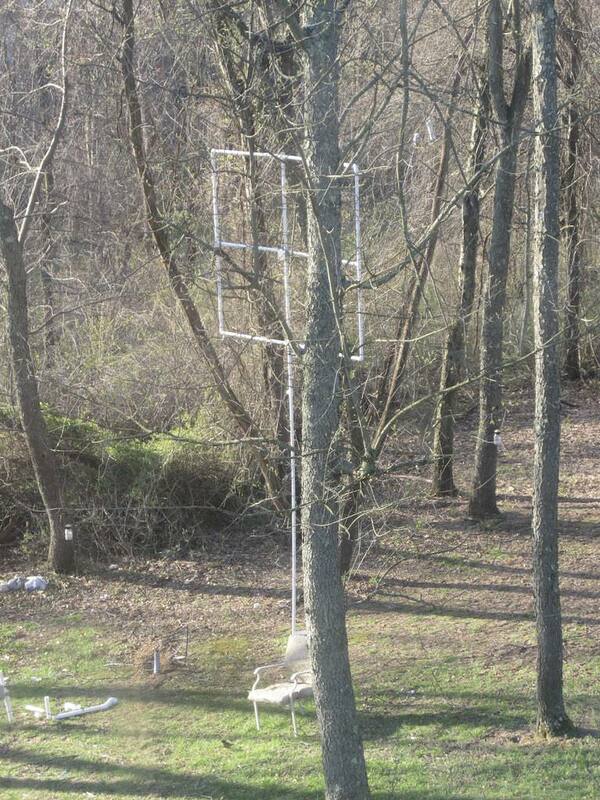 Not visible is the rope from the top of the antenna, over a tree branch, taking most of the weight. It is not on a rotor, the primary use of this antenna is for listening to the upper half of HF, where it is not particularly directional. Paint it olive drab and hoik it into a tree and no one would know it was there. Would it work stuck up against the side of a building, I wonder? Probably not very well. In addition to the wall blocking signals, you'll pick up all the RFI generated inside the building. I'm using my hamfest find, a rotor, to make the crossed parallel loop rotatable. I find that it is indeed directional. On MW, I can get 20 to 25 dB nulls, sometimes 30 dB. On HF, I can get 10 dB or so, on CHU and CFRX. I'll need to try some other stations. Tough to null the HF skywave when your loop elevation angle is fixed. I do have a linear actuator stashed in the basement, which in theory I could use to rotate the loop on that axis. I wonder how much more of a null that would give me (and how stable it would be as the ionosphere does its dance). Any way to feed it so it is more vertically polarised? That would reduce the skywave component and allow for more accurate df work. Such as, a loop fed in the middle top or bottom will be h, a square loop fed in a corner should be v.